These are the posts my husband laughs at. He asks, "do you guys just sit around giving each other awards?" Well, yes, yes we do. Because that's just how awesome we are out here in the bloggie world! Laura, of Laura's Reviews, bestowed this one on me. Can't help but think of Telly Savalas, as Kojak and sucking on a Tootsie Pop, whenever I see this award. The Who Loves You Baby! 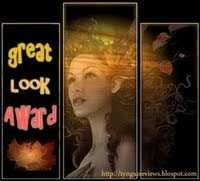 Award is given to those bloggers whom you love and who have awarded you in the past. I'd add more of you here, but it's getting late and I need to get another post done before I go to bed so I can get up bright and early for the read-a-thon. If you've awarded me in the past, this one's for you! Now it's my turn to blush! Thanks! What your hubbie doesn't realise as he snickers, is that awards help build community. And after all that is what blogging is all about! And congratulations on the awards you received! Thank you for my award and a big congratulations on your awards won! This just made my day! Wow - thanks for the fantastic award!